Ethan is almost 15 months and he's not a baby any more but he's not quite a toddler. He's walking around confidently as long as he can hold onto the sofa in our lounge or the gate at nursery. He's chatting away most of the day and gradually learning new words or noises. We understand what he wants more and more and he can now tell us if he wants water or if he wants to eat one part of his lunch in particular, by saying 'dor, dor' and pointing purposefully. He can tell us no or push us away if he doesn't want something and is strong-willed. If he doesn't want to go un his car seat, he will arch his back and refuse to bend his knees, or if I leave the room, he will stomp on his knees to the gate in the doorway and cry. Not always proper crying, just whining for attention even though I have only left the room for a moment. He's learning every day and he's happy playing games with himself or asking us to join in by reading a book or rolling his ball back and forth to him. Some of his clothes are getting a bit small (as they seem to do after a few washes) whilst the next size up is still far too big. 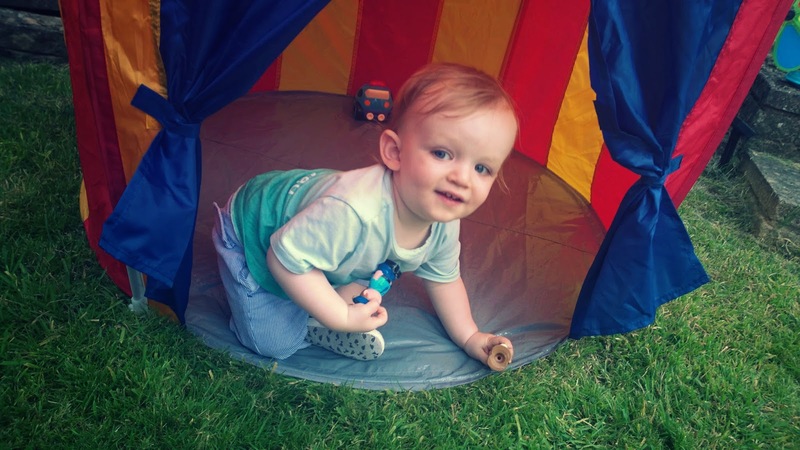 Some of his toys are no longer as interesting but there isn't a lot of choice specifically for his age, until he reaches 18 months, as I recently wrote about. Not the teenage, potty-mouthed misfit kind like Will, Simon, Jay and Neil from the TV show and movies. Just a baby-almost-toddler learning about the world and what he can do. Next week, he's moving up to baby room two at nursery. Seven months at nursery and he's ready for the next stage. He will have more structure and more freedom all at the same time, and even his meals start to change as he grows more independent. He's ready for some things and not so much for others. It's an interesting stage, one where we reflect back on everything that's been and look ahead to everything that's yet to come. My wonderful, inquisitive, outgoing inbetweener.